For the full, original article, feel free to visit the Trial by Fire. ILWU rank and file, Occupies in Longview, Portland, Seattle, Oakland, LA and other West Coast Occupies are organizing to blockade a grain ship coming to Longview. This ship is intended to load scab cargo from the EGT terminal. The date won’t be known until 3-4 days in advance, but is anticipated to be sometime in January. There’s a war going on against dockworkers and their families in Longview, Washington. Members of International Longshore & Warehouse Union Local 21 have been arrested, beaten and their homes have been raided. They are fighting to protect their union jobs against EGT, which is trying to break the ILWU’s coast-wide contract, established after the 1934 San Francisco general strike and West Coast Maritime strike. EGT, and their majority partner, Bunge NA, want to bust the ILWU, one of the most militant, progressive unions in the U.S. EGT has defied the contract with the Port of Longview and used scab labor to load its grain terminal. On Sept. 8 hundreds of angry longshore workers charged through the gates of the new EGT export grain terminal at Longview. EGT claims that grain was dumped from a 107-car train, and a cyclone fence torn down. At a time when national union membership has dropped to a 70 year low of 11.9%, and private sector workers in unions fell to 6.9%, this is part of the 1%’s attack to drive us all to the bottom. Even at these low membership rates, nationally, median weekly wages for union members are $917, compared to $717 for workers not in unions. The 1% not only wants to take away that extra $200 from the remaining 14.7 million, who are unionized, but wants to destroy all unions, especially the militant ILWU, to keep us from organizing to take back what’s rightfully ours. EGT is part of “the 1%” – a joint venture between U.S.-based Bunge North America, Japanese-based Itochu, and Korean-based STX Pan Ocean. A ship hoping to load scab cargo from the EGT terminal is expected to arrive in Longview early in 2012. If EGT is successful in its attack on the ILWU in Longview, it will have a ripple effect on all port workers on the West Coast. 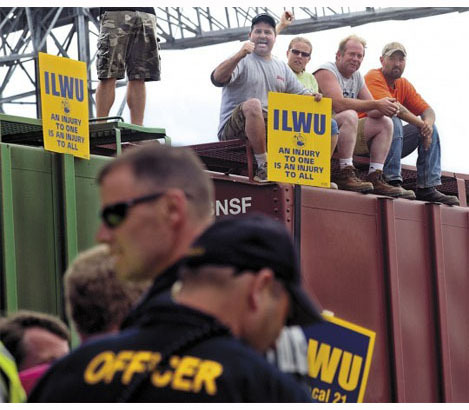 The ILWU is a democratic, bottom-up union, with an activist rank and file, which has a strong history of support for community issues, standing up against Apartheid South Africa, against the war in Iraq, for the Wisconsin state workers’ struggle against union busting. Bay Area ILWU Local 10 backed community protests about the police murder of Oscar Grant. They honored picket lines in Occupy Oakland’s 11/2 General Strike and 12/12 West Coast Port Shutdown. Caravans to Longview and support actions are being organized up and down the West Coast, nationally and internationally, to arrive in Longview to greet the STX ship coming to load the scab grain. The Bay Area’s ILWU Local 10 has pledged support for ILWU Local 21′s struggle against EGT and their union busting drive, funding a bus to Longview. The San Francisco Labor Council is on board. If you want to be part of this critical working class struggle, please fill out the the sign-up form. We need you and your organization to commit to join the caravan, or other solidarity actions, and contribute to this important campaign of solidarity. Again, the date won’t be known until 3-4 days in advance, but is anticipated to be sometime in January. As soon as we have official word of the ship’s pending arrival, we will contact you, by email and phone, to let you know it’s time to mobilize to Longview. If you have a car, and are able to take others, please indicate this on the form. Supporters will also be renting vans and buses. If you want to be a passenger, again indicate so on the form. I might go if someone was organizing a caravan in my area, but I am on the east coast.